George has his first taste of speedway on a rubbish tip in Oxford! He got his first rides at Aldershot in the second half races of 1959 and stepped up into the team the same year in the Southern League, at that time George was a tanker driver. He joined Trevor Redmond in 1960 and was given a place at Yarmouth. In 1961 he went North to Newcastle in the PL and had some outings at Oxford in the NL though he ended up with a broken jaw. 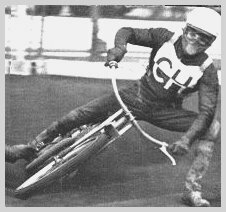 Trevor Redmond opened at Neath Abbey in 1962 and although they rode four of their home matches at St Austell due to lack of lighting, George learned a lot and they finished second in the PL. Due to lack of support Neath closed at the end of the season and the whole lot including George moved to St Austell. He continued to improve with the Gulls and had plenty of outings with Oxford too. With the problems in speedway in 1964 with riders being threatened to lose their licences by the Control Board George joined Norwich where he rode in 11 meetings up until Mid May then when his average forced him to drop to reserve he joined Cradley in the PL. He was badly needed at Dudley Wood and became an immediate star, he scored his first maximum in his 4th match (against Middlesborough) and finished second behind Ivan Mauger in the Alan Hunt Memorial Trophy in July. However in September George fell in the KO Cup Final at Newport and broke his wrist. In 1965 the British League was formed and George held his own against the top riders until at the end of May against Wolves he crashed and suffered concussion and Knee damage, he was back within 3 weeks to score 13 points at Newcastle then 2 weeks later he aggravated his knee injury and was out for a further 6 weeks. He was mysteriously transferred to Sheffield along with Johnny Hart in 1966 but broke his leg in his first race for the Tigers and it was almost the end of the season when he returned. He stayed with Sheffield in 1967 but was not the George Major of old. 1968 saw George join Johnny Hart again this time at Leicester but after two seasons with the Lions moved down to the Second Division with Doncaster where he was their top scorer with an average of 10 points. He joined Birmingham when they opened in 1971 and stayed with the Brummies as a heat leader until 1975, when he hung up his leathers for good. George is still involved with speedway as team manager at Ryde, Isle of Wight. Copyright: Steve & Phil Johnson & Cradley Heath Speedway Ltd, 2004.